Diabetics can eat and drink just about anything they want, milk included, so long as they adapt their intake according to their individual nutritional requirements and the restrictions of their condition. Both whole and low-fat or skim milk are well tolerated in limited amounts, assuming the diabetic patient can digest dairy (is not lactose intolerant). If lactose intolerant, there are non-dairy options available as well, including but not limited to almond, rice, soy and coconut milk. Today’s article concerns itself with the benefits and side effects of dairy milk in diabetic diets. 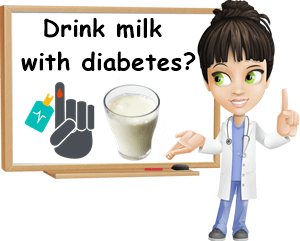 Studies about the consumption of dairy milk and its effects on diabetes show that drinking milk as part of an overall balanced and varied diet, suited to your individual nutritional requirements, does not increase the risks for type 2 diabetes. Even more, the dairy product elicits a positive post-meal glucose response that can extend to the following meal, proving to be a good food for managing type 2 diabetes. Of course, moderation is key and intake should be limited to small amounts, best determined according to the diabetic patient’s individual nutritional requirements. Milk carbohydrate, sugar, fat and protein content. On average, 100 g of whole cow’s milk provides 4.6 to 5.4 g of carbohydrates in the form of the sugar lactose (made up of two simpler forms of sugar, glucose and galactose). It also has an average of 3.3 to 4.6 g of fat and 3.3 g of protein. 100 g of whole sheep’s milk has around 5.1 to 5.36 g of carbohydrates in the form of the sugar lactose, 7 g of fat and 5.4 to 5.98 g of protein. 100 g of whole goat’s milk has about 4.4 to 5 g of carbohydrates (all lactose); 2.9 to 4.1 g of fat and 3.1 to 3.5 g of protein. As you can see from the data above, whole milk is a relatively moderate source of sugar (lactose). When consumed in limited amounts, it does not raise blood sugar levels too much or too fast. What contributes towards this effect is the fat and protein content. Both fat and protein take longer to digest and delay the digestion of lactose too, contributing to a steadier, more controlled rise in blood sugar levels. The higher the fat content, the better it is for blood sugar control. Actually, study results show that drinking milk also helps reduce the glycemic response of other foods as well, contributing to better post-meal blood sugar numbers. For example, you can have milk with high-carbohydrate cereal in the morning and enjoy good blood sugar up until the next meal. Of course, moderation when eating is important so remember to not exceed recommended portions. Source: B. Kung, G.H. Anderson, S. Paré, A.J. Tucker, S. Vien, A.J. Wright, H.D. Goff. Effect of milk protein intake and casein-to-whey ratio in breakfast meals on postprandial glucose, satiety ratings, and subsequent meal intake. Journal of Dairy Science, 2018. You’d think that low-fat and non-fat milk are healthier options and better for diabetes than whole milk, but that’s not quite true. Fat and protein slow down digestion and the rate of sugar absorption into the bloodstream. The higher fat and protein content actually reduce the effects of milk on blood sugar metabolism, which is good for diabetes. The only reason why low-fat options are recommended is to keep weight under control (since type 2 diabetes is often brought on by excess body fat as well as made worse by weight gain). Low-fat food options of all sorts are seen as better options for anyone who is required to manage their weight. But it’s not actually fat that causes weight gain so much as carbohydrates. Carbs are readily digestible (the simpler the carbohydrate, the quicker it releases energy) and whatever is not used right away gets deposited as fat tissue, contributing to weight gain. So long as your intake of milk is moderate, according to your individual nutritional requirements, it won’t cause weight gain. But if you are required to lose some weight, you can start by addressing other aspects of your diet and excluding high-carbohydrate foods, especially those richer in simple carbohydrates and replacing them with foods high in complex carbohydrates and fiber such as whole grains (for a slower release of energy). It’s also important to maintain a healthy level of physical activity for weight management. Whole milk further provides satiation and helps keep you full for longer. In addition to this, it has a moderate energetic value: 100 g has only 60 kcal, a moderate amount that allows for frequent consumption without causing weight gain. 1) Does not raise blood sugar levels excessively or too fast. 2) Lowers the effects on blood sugar of high carbohydrate foods it is paired with. 3) Studies show milk consumption can lower type 2 diabetes risks. 4) Does not promote weight gain. 5) Fills you up for longer and provides long-lasting energy. 6) Good protein source for a stronger immune system response. 7) Rich in vitamins B12 and B2 for energy metabolism, skin and nervous system health. 8) Source of magnesium and potassium for healthy blood pressure numbers (for diabetes-related hypertension). Diabetes and whole milk make a good pair so long as consumption is moderate, according to the diabetic patient’s individual nutritional requirements and the restrictions of their condition. Whole milk is nutritionally superior to low-fat and non-fat options and has rather minimal effects on blood sugar (when consumed in moderation). The fat and protein in it help delay digestion and the rate of sugar absorption into the bloodstream, contributing to a better glycemic response which can extend to the next meal. Studies even show that milk consumption may contribute to lower type 2 diabetes risks. But overall, both whole and low-fat options can be considered for a diabetic diet.